Dr. Sylvia Lafair, President of Creative Energy Options, Inc. is an expert on leadership and workplace relationships. Her new book “Don’t Bring It to Work: Breaking the Family Patterns that Limit Success” is available at bookstores everywhere. Visit www.ceoptions.com or www.sylvialafair.com. Dr. Lafair, who was a practicing family therapist, took her talents into the work world and has revolutionized the way employees react and teams cooperate. 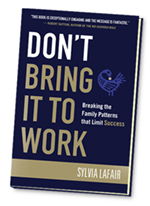 Dr. Lafair is the author of Don’t Bring It to Work: Breaking the Family Patterns That Limit Success published by Jossey-Bass. This is the first book to explore what happens when patterns originally created to cope with family conflicts are unleashed in the workplace. She has also written numerous articles for trade publications and national magazines.